Bolt Security Seals are high-strength security seals used on shipping containers, railroad and air freight containers. The solid metal core head and a locking cylinder that is encased in shock proof plastic makes for a high level security seal and an efficient tamper deterrent. The Forca Bolt Seals are high security container seals, with printing and numbers encapsulated by a clear polycarbonate cover to protect it from tampering. It has a flat marking plate available for barcode. The Glatt Bolt Seal is cost-effective solution for securing containers. It has round barrel only accept laser name & sequential numbers. 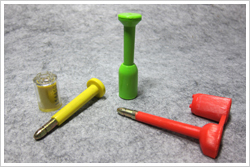 The Raket Bolt Seal is a high security container seal consists of a blot and a body part that are manually atteched. The bolt has a non-spin feature when engaged, and the locking mechanism, is embedded in a groove in the metal bush, making the seals stronger and more difficult to tamper. The bolt seal can accept dual marking on bolt and casing. The Virtues Bolt Seal is a high security bolt seal, with printing and numbers encapsulated by a clear polycarbonate cover to protect it from tampering.